Recent blog posts have discussed the legal ramifications of the use of performance enhancing drugs (“PED’s”) by baseball players, especially as it relates to Yankees slugger Alex Rodriguez. Several recent developments regarding these issues have raised a new legal point, a discussion of which may be helpful to our blog readers. More specifically, former player Jack Clark, who has been retired from baseball since 1992, stated during his radio show that he believes that current Angel player Albert Pujols has used PED’s throughout his career. Reaction to this statement was immediate, with Pujols denying he had ever used PED’s, and stating that he would sue Clark for libel. In addition, the radio station employing Clark as a talk show host promptly fired Clark and distanced themselves from his comments. The legal issues that we will discuss here are whether Pujols should sue for libel, and the likelihood of success of such a lawsuit. Legal claims for libel (written statements) and slander (spoken statements) are commonly called defamation actions. Broadly, they are claims that someone either spoke or wrote an untrue statement that harmed one’s reputation in the community. In order to prove such a claim, one would first have to prove that the statement was made, that such statement was untrue, and that one’s reputation was harmed as a result of the untrue statement. 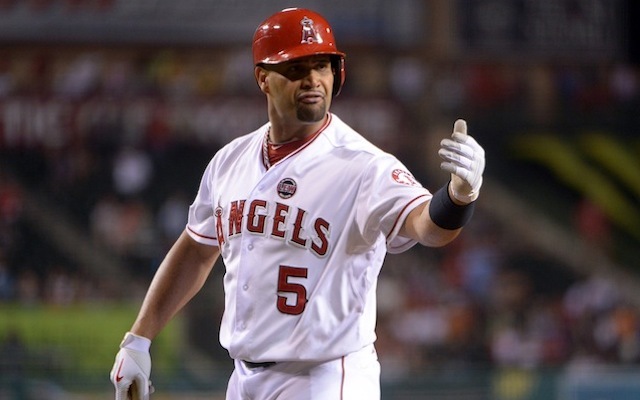 In the Pujols situation, it would be fairly simple to prove that the statement was made. It was widely broadcast on the radio, and a transcript could be taped and such evidence presented to the Court. The second hurdle would not be as easy. Truth is an absolute defense to a defamation lawsuit. Pujols would therefore have to prove that he never used PED’s during his career. It is not easy to prove a negative. As the party suing (the “plaintiff”), Pujols would have the burden of proving that he was a “clean” player throughout his career. Clark’s lawyers would have a opportunity to rebut this claim through testimony and any other type of evidence they could gather regarding Pujols. Even if Pujols’ attorneys were able to meet these burdens, there is an additional legal hurdle which must be surmounted to succeed on a defamation claim. In 1964, the U.S. Supreme Court ruled in New York Times Co. v. Sullivan that, in order for a public figure to be awarded damages in a defamation claim, the false statement being sued upon must be made with “actual malice.” Actual malice was defined by the Court as either actual knowledge that the defamatory statement was untrue, or that the statement was made with reckless disregard for the truth. Our readers may ask why there is a heightened standard for such claims when a public figure is involved. The U.S. Supreme Court felt that the interest in balancing free speech (First Amendment) rights required a different standard so that there could be fair criticism of public figures in the news media without a constant fear of defamation lawsuits. Exactly who qualifies as a public figure has been the subject of additional Court cases. There can be no doubt, however, that as a major star in Major League Baseball since his rookie year of 2001, that the Courts would certainly rule that Pujols should be considered a public figure. Therefore, in order to win damages for Jack Clark’s alleged defamation, Pujols would have to prove that Clark had actual knowledge that his statement regarding Pujols was false, or that Clark acted with reckless disregard for the truth. Clark claimed that his statement was based on conversations he had with a former trainer who had interacted with Pujols. If Clark can establish a foundation for this claim, even if his statements were proven to be untrue, it might show that he (Clark) believed his statements about Pujols were true at the time he broadcast them. This would mean Pujols would not succeed in his defamation suit, as he could not prove “actual malice” on the part of Clark in making the defamatory statement. The U.S. Supreme Court has ruled that, in order to satisfy the First Amendment and freedom of expression protections flowing from it, public figures must meet a higher standard in order to recover damages for defamation. This makes it extremely difficult for someone like Albert Pujols to win such a lawsuit. If Pujols brings such a case, it would be risky as the public is not likely to understand the legal requirements for success, and may simply remember that Pujols sued for libel, and lost the case. Such a lawsuit may also bring other unpleasant facts to public light. Pujols might be better advised to forego any legal action and remember that the public has a very short memory.